Pulmonary Rehab...Your journey to a more active life! 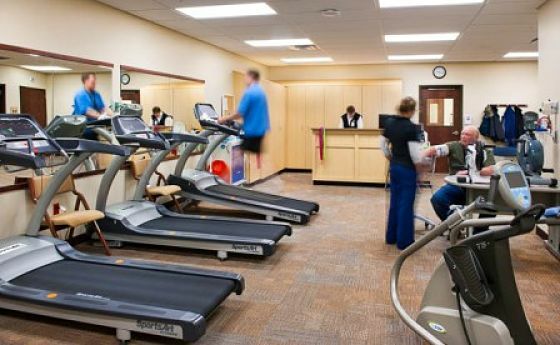 The Pulmonary Rehabilitation Program at Cabinet Peaks Medical Center is a multi-disciplinary program that cares for patients with chronic respiratory impairment. The program is individually tailored and designed to optimize physical and social performance and independence. Pulmonary Rehabilitation is for patients with Chronic Respiratory Diseases such as Chronic Obstructive Pulmonary Disease (COPD), Emphysema, Chronic Bronchitis, Pulmonary Fibrosis, Asbestos Related Disease, and other conditions. The main goals of pulmonary rehabilitation are to help you improve the quality of your day-to-day life and restore your ability to function independently. The pulmonary rehabilitation team is comprised of physicians, nurses, respiratory therapists, dieticians, physical therapists, and social service professionals. This multidisciplinary team approach is used to assist individuals in achieving their optimal physical, psychosocial, and vocational potential. Our program combines education with therapeutic exercise and functional activities into a comprehensive program, 2 times per week. To provide a better understanding of your lung disease and medications. To prevent and/or slow the effects of your lung disease. To improve your level of independent functioning. To learn more effective breathing techniques. To reduce the need for hospitalization. To improve self-esteem and well being. To help establish lifelong healthy lifestyle habits. The exercise program is individualized based on your abilities. We work to increase your strength, endurance, and flexibility. You will help develop your own goals and will be involved in monitoring your progress under the direct supervision of a Registered Nurse. Learning new breathing techniques will help you move more air in and out of your lungs. You will be taught breathing techniques to help you feel less short of breath. The support you receive from the fellow members of the pulmonary rehabiliation progam makes for a fun, motivating environment. The encouragement you receive from the pulmonary rehabilitation team of professionals makes for an environment where goals can be met and lives can be changed. Medicare pays 80% and secondary insurances generally pick up the remaining 20%. Most insurances that cover outpatient services pay 80%; some may require prior authorization before starting the program. Check with your own insurance company. The Cabinet Peaks Financial Resource Counselor can help you determine your coverage. A written referral from your physician is required in order to participate in this program. Want more information? Sign up below to receive our e-mails.